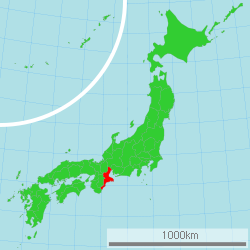 Mie Prefecture (三重県, Mie-ken) is a prefecture of Japan, which is part of the Kansai region on the main Honshu island. The capital is the city of Tsu. 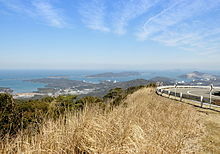 Until the Meiji Restoration, the area that is now Mie Prefecture was made up of Ise Province, Shima Province, Iga Province, and part of Kii Province. Evidence of human habitation in Mie dates back more than 10,000 years. During the Jōmon and Yayoi periods, agricultural communities began to form along the river and coastal areas of the region. Ise Shrine is said to have been established during the Yayoi period, and in the 7th century the Saikū Imperial Residence was built in what is now Meiwa Town to serve as both a residence and administrative centre for the Saiō, an Imperial Princess who served as High Priestess of Ise Shrine. During the Edo period, the area now known as Mie Prefecture consisted of several feudal domains, each ruled by an appointed lord. Transport networks, including the Tokaido and Ise Roads, were built. 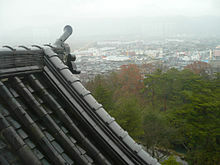 Port towns such as Ohminato, Kuwana and Anōtsu, posting stations and castle towns flourished. Pilgrimages to Ise Shrine also became very popular. After the Meiji Restoration, the former provinces of Ise, Shima and Iga as well as a portion of eastern Kii, were organized and reorganized repeatedly. In 1871 the area from the Kiso Three Rivers in the north to present-day Tsu became Anōtsu Prefecture, and the area south of that became Watarai Prefecture. In 1872, the Anōtsu prefectural seat moved from Tsu to Yokkaichi, and the prefecture itself was renamed Mie. For a variety of reasons, including the strong likelihood that Mie would eventually merge with Watarai, the prefectural seat returned to Tsu the following year, and Mie Prefecture took its present-day form in 1876, when it merged with its southern neighbor. The name Mie supposedly was taken from a comment about the region made by Yamato Takeru on his way back from conquering the eastern regions. In 1959 many lives were lost as parts of Mie were devastated by the Ise-wan Typhoon, the strongest typhoon to hit Japan in recorded history. Crops were destroyed, sea walls ruined, roads and railways damaged and a substantial number of people were injured or left homeless. In May 2016, the city of Shima hosted the 42nd G7 summit, the third summit without the presence of Russia. Mie Prefecture forms the eastern part of the Kii Peninsula, and borders on Aichi, Gifu, Shiga, Kyoto, Nara, and Wakayama. It is considered[by whom?] part of the Kansai and Tōkai regions due to its geographical proximity to Aichi Prefecture and its cultural influence from Kansai, such as the fact that Kansai dialect is spoken in Mie. Traditionally, though, the Iga region of Mie is considered to have always been a part of Kansai. 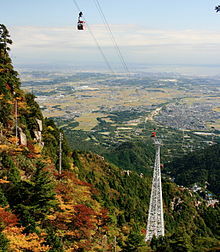 running from central Mie to its southern borders is the Nunobiki Mountainous Region. Mie has a coastline that stretches 1,094.9 km (680.3 mi) and, as of 2000, Mie's 5,776.44 km2 (2,230.30 sq mi) landmass is 64.8% forest, 11.5% agriculture, 6% residential area, 3.8% roads, and 3.6% rivers. The remaining 10.3% are not classified. The Ise Plain has a relatively moderate climate, averaging 14 to 15 degrees Celsius for the year. The Iga Basin has more daily temperature variance and averages temperatures 1 to 2 degrees cooler than the Ise Plain. Southern Mie, south of the Shima Peninsula, has a warmer Pacific marine climate, with Owase Region having one of the heaviest rainfall figures for all of Japan. Mie Prefecture has traditionally been a link between east and west Japan, thanks largely to the Tokaido and Ise Pilgrimage Roads. Traditional handicrafts such as Iga Braid, Yokkaichi Banko Pottery, Suzuka Ink, Iga Pottery and Ise Katagami flourished. With 65% of the prefecture consisting of forests and with over 1,000 km (600 mi) of coastline, Mie has a long been associated with forestry and seafood industries. Mie also produces tea, beef, cultured pearls and fruit, mainly mandarin oranges. Food production companies include Azuma Foods. Northern Mie is home to a number of manufacturing industries, mainly transport machinery manufacturing (vehicles and ships) and heavy chemical industries such as oil refineries. As well as this, Mie Prefecture is expanding into more advanced industries including the manufacture of semiconductors and liquid crystal displays. In Suzuka, the Honda Motor Company maintains a factory established in 1960 that built the Honda Civic as well as other vehicles. Ise Grand Shrine - Japan's holiest Shinto shrine. Tsubaki Grand Shrine - Japan's oldest Shinto shrine. Kumano Kodō - World Heritage Site. Ancient road in southern Mie once used by pilgrims. Iga-Ueno - Birthplace of the ninja and home to the Iga Ninja Museum. Sakakibara Onsen - Famous onsen near Tsu, considered to be the 3rd best onsen in Japan. Yunoyama Onsen - Famous onsen near Yokkaichi that sits atop Mount Gozaisho. Nagashima Spa Land - One of the largest amusement parks in Japan, located in Kuwana. Mikimoto Pearl Island - Museum in Toba that is dedicated to Kōkichi Mikimoto, inventor of pearl cultivation. Suzuka Circuit - Japan's most famous motor racetrack. Saikū - Site of Heian Imperial residence, with modern museum and reconstructed Heian building. ^ "General overview of area figures for Natural Parks by prefecture" (PDF). Ministry of the Environment. Retrieved 3 February 2012. ^ "Azuma Foods Co., Ltd.｜Company Profile". Azumafoods.co.jp. Retrieved 2012-07-13. ^ Hamlin, Suzanne (13 August 1997). "From Japan, A Big Wave Of Seaweed". The New York Times. 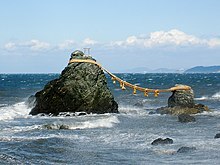 Wikimedia Commons has media related to Mie prefecture.